LAPPCO was selected to help make Chicago home to the $150 million University Center, America’s largest joint residence hall, providing housing for nearly 1,700 students attending Columbia College, DePaul University and Roosevelt University. Rapid growth in enrollment, along with limited funding concerns, made a joint dormitory an ideal solution. 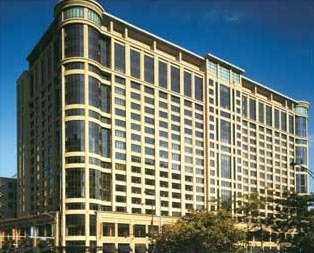 The 18-story University Center offers a variety of housing options for undergraduate, graduate and professional students. LAPPCO created and installed approximately 1,400 custom designed precast panels to clad the building within a carefully controlled timetable. Completing the 702,000 square foot building in only two years was a high priority and played a crucial factor in the construction manager’s selection of LAPPCO to be part of the building team. 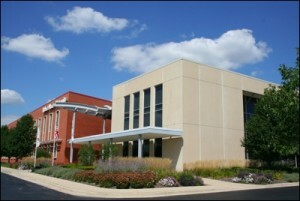 Schools are a perfect use for prestressed sandwich wall panels. These panels have the insulation encapsulated between the exterior and interior walls. They provide excellent insulation and r-values. They allow for faster and more economical installation. The finished interior layer is tough, great for schools, and eliminates the needs for costly interior finishing. The exterior was acid-etched for an attractive look. 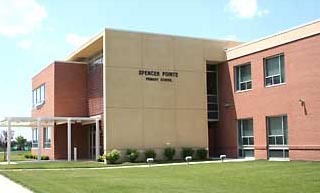 This striking addition to the existing high school was constructed using prestressed, insulated, sandwich wall, acid-etched load bearing panels with circular windows. Previously, as stated, the use of sandwich wall construction is ideal for schools. It is solid, quicker to install and provides pre-finished tough interior walls. 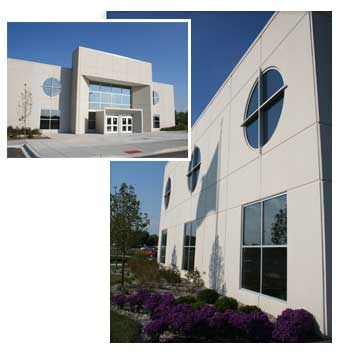 This project was all precast prestressed load bearing acid etched panels. Here we have a perfect example of the major advantages of precast concrete. The cost effectiveness of load bearing panels is substantial. This was a very escalated scheduled with all panels erected within one week. This also saved a considerable amount on time and labor. This is an excellent example of the substantial cost savings which precast construction can deliver. 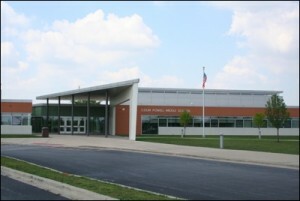 The school district had a very tight budget for this much needed school. LAPPCO was selected for this all precast panel building. The panels had a painted finish done on site.